Our Amish Madison Contemporary Ottoman checks off these three boxes and so much more with it's unique, 48" wide design that combines a modern design with contemporary features and rustic charm. The size of this living room accent makes it versatile -- use it as a coffee table with a trendy upholstered top, as an ottoman with a sofa, love seat or two chairs, or as a bench seat in any room of the house! It's also just stinkin' comfortable and built to last. This piece also features an open shelf and four solid wood square legs. 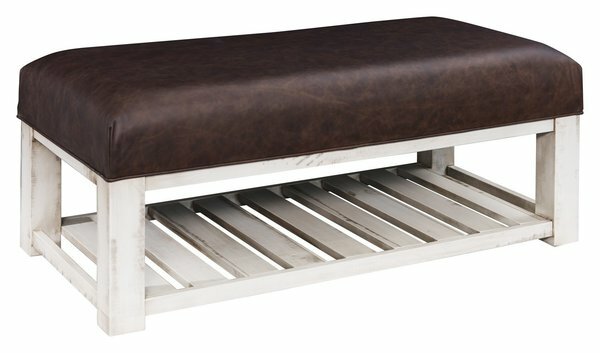 Shown with Texas leather upholstery, with base in white paint with Van Dyke brown glaze, and with simulated barn floor marks, this piece can be customized with a variety of options. Shown in Barn Floor Wood.Top shown in Tanbark FC-7136. Base shown in white paint with van dyke brown glaze. Barn Floor Wood is new lumber with a distressed look. This product is available without barn floor distressing upon request.